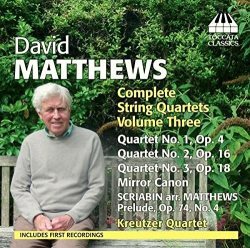 English composer David Matthews has a substantial body of work. There are almost as many quartets as Beethoven wrote and several more symphonies plus the usual body of choral and instrumental pieces, some very large scale. So I am slightly ashamed to admit this is the first disc of his music I have heard despite well over half a century of concert-going and record collecting. The quality on display here in these early pieces is very striking and I for one will be investigating more of his output. Those who have bought the first two volumes (TOCC0058 ~~ TOCC0059) in this series of the complete quartets will doubtless buy this one regardless of what I say. Early though they are, these three pieces are very impressive, very listenable yet complex and satisfying. It is good to have heard them first because it is now possible to follow the later developments at least partially in sequence. The growth of style is evident from the craggy, tough and decidedly expressionist First Quartet through to the more compact and developed Third Quartet. In the Quartet No.1 the six movements are played without a break - though tracked for access on this Toccata issue. This is not music for 'light' listening but it has a strong sense of direction and is no tougher than Bartók or Robert Simpson. The composer describes the music as influenced by the Second Viennese School and it does sound reminiscent at times of Berg. In his own account of his musical influences he notes that he follows, " a path similar to that which Britten and Tippett were following, and also one rooted in the Viennese Classics - Beethoven above all - and also in Mahler and the early 20th-century modernists - Stravinsky, Schoenberg (not the twelve-note Schoenberg), Berg and Bartók". The Quartet No.2 opens with insistent rhythms more like Shostakovich than those composers mentioned above, but by the second movement hints of Bartók do indeed appear. These first two movements make for exciting listening. The finale is slower but punctuated by angry outbursts. Matthews notes this was written in memory of a friend who died in tragic circumstances but this music speaks less of loss than of strong regret of what might have been. It is very moving. The Quartet No.3 is played continuously and is again trenchant, rhythmic and at times angry with much use of dissonance. The second movement is marked tranquillo but is mostly far from tranquil. The finale is the longest movement and initially maintains the conflict but manages a quiet resolution. The remaining two items, the Mirror Canon and the arrangement of a Scriabin prelude, are very short exercises and do little more than make up the length of the disc. Throughout this disc the Kreutzer Quartet have all the complexity well under control. What an impressive group of musicians they are. Their discography shows a devotion second to none to the twentieth century British and American quartet repertoire. Clearly this David Matthews cycle is in safe hands. The engineers have done a good job. The stereo picture is well spread between the speakers. Do not be misled, as I was initially, by the photograph on the CD cover, of this white-haired gentleman sitting on a park bench. This music is strong and emotionally complex. A reminder that less prominent composers might well not deserve that status.